I view Crayola as “The Great Teacher of Color,” because we trust them, as we do so many corporations in our capitalist-enamored America, to teach our children colors based upon Crayola’s interpretation and marketing motives. 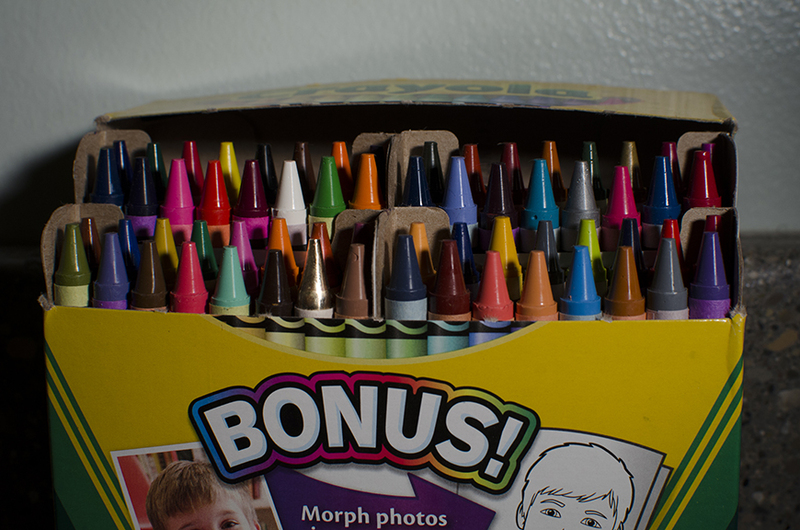 Across many states and two countries (so far) a single crayon has been surreptitiously replaced by a crayon made out of actual bronze in random crayon packs in stores. No indication is given as to the source of this bronze crayon. Presumably these bronze crayons will fall into the hands of children, who have no understanding or influence of value systems created by the economy of fine art. This crayon is left in place for the recipient’s unfiltered reaction between the object and their imagination, leaving the object’s value to be determined solely by the relationship of the object. These bronze crayons are not for sale, though many have expressed interest in buying them. The ego, both mine and others, have begun to create a separate value for these crayons, that the recipients do not know about. As I place them in the world, I leave clues via instagram photos hinting of their locations to fuel both mine and others selfish desires. This also serves as a mapping system of sorts that tracks my travels, much like geotagged photos in social media. The action of searching for unsuspecting distributors for these crayons as I travel harkens back to the roadside attraction culture of American history, and it draws a connection between current and dying modes of exploration. As these crayons get dispersed all over the country and world they assemble to create a constellation type sculpture. Perhaps this is the largest bronze sculpture in history. Also there is a Bronze Constellation app for Android devices. Click the link for more information. So, you’re kinda like Willy Wonka. Thanks for vising Yoidles.com, Mason. We will gladly add you to our mailing list. Please tell your friends about us. Is Brooks Wenzel “some sort of socialist”? Hardly. He’s just another entrepreneur, building his brand. That he gives away bronze crayons is no more revolutionary (or anti-capitalist) than the Publisher’s Clearinghouse Sweepstakes. Make no mistake, Mason: Mr. Wenzel means to get paid. That payment may come in the form of gallery representation, or a teaching gig, but the fact that he can trade his intellectual property for dollars is an affirmation of capitalism, not a critique of it. Oh, and that “embarrassing” modern art, those “product[s] of a diseased mind”? Turns out many American corporations have art collections featuring work more or less identical to what Mr. Wenzel produces. Not because American corporations are secret bastions of socialist revolution–rather, the free market economy has judged such work valuable, and a good investment. This (apparently), in spite of the opinions of Al Capp. But then, capitalism really is greater than any individual opinion, isn’t it? When I dictionary.com’d Mason – I get: a person whose trade is building with units of various natural or artificial mineral products, as stones, bricks, cinder blocks, or tiles, usually with the use of mortar or cement as a bonding agent. It is my interpretation that Mason fits the definition of his name and is only capable of seeing within the masonry walls he has constructed around himself; unable to peer through the brick and mortar borders he has trapped himself within. Only capable of seeing his superficial, walled off worldviews that confine him to a simplistic view of reality. Yoidles.com artwork has meaning, depth, and incorporates social, political, and cultural interpretations, something Mason and his walls are unable to interpret or understand. Although brick and mortar make great foundational construction materials, it takes maturity, knowledge, compassion, and the willingness to learn about oneself to truly identify with art, i.e. exploration into other mediums which add depth to the structure (your perception). And while knowing what famous historical figures have said in the past, quoting others’ words doesn’t make you smart or original, it makes you look desperate and scared, much like your intimidation on quality artistic capabilities.